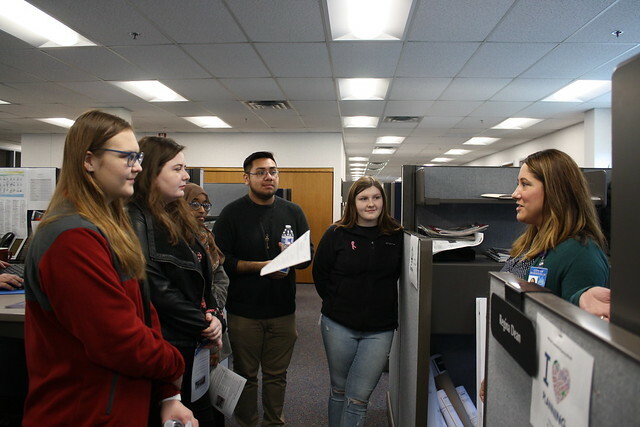 Students in Burnsville High School teacher Colleen Coleman’s American Government CIS (College in the Schools) class visited Burnsville City Hall on Nov. 8 to enhance their understanding of the role of local government. Elizabeth Kautz, mayor of Burnsville, greeted fifty-five students upon their arrival. The students rotated through 10 departments ﹘ including Finance, Human Resources, IT, Communications, Administration, Community Development, Fire, Police, Parks and Recreation and Public Works/Engineering ﹘ to see how each area of government functions. Representatives from each department had a brief presentation about their role in government, explaining why they got into government, what their daily work entails, and what kind of training or specialized education they need for their jobs. The tour concluded with a mock city council meeting, in which students assumed roles in conducting a meeting. Kaylee Martynow, a senior who plans on studying international business in college, was delighted and honored to play the role of mayor in the mock city council meeting. College in the Schools is a program in cooperation with the University of Minnesota, where students may gain college credit for satisfactory completion of specific courses like American Government. Students at Burnsville High School earn more college credit through these CIS courses than at any high school in Minnesota.